Amy Chua is best known as the “Tiger Mother.” That not entirely complimentary moniker came from her 2011 book, Battle Hymn of the Tiger Mother, in which Chua described and espoused her (and her husband’s) super strict child-rearing methods. Not coincidentally, reaction to the book brought her a mountain of media attention. But Amy Chua is much more than a mother with strong ideas about kid discipline. She graduated from Harvard and its law school, clerked for a U.S. Court of Appeals judge, and went on to work in a big law firm. Today she is a professor at Yale Law School. Chua’s specialty is ethnic conflict and globalization. Her books include World on Fire: How Exporting Free Market Democracy Breeds Ethnic Hatred and Global Instability and Day of Empire: How Hyperpowers Rise to Global Dominance—and Why They Fall. Which brings us to her latest provocatively titled book, Political Tribes: Group Instinct and the Fate of Nations (Penguin, 293 pp., $28). In it, Chua takes an American-centered look at the impact of “tribal instinct,” aka “ethno-cultural rivalry,” on U.S. foreign policy and domestic politics, including the 2016 presidential election. Chua devotes a twenty-page chapter in the book to the Vietnam War–and why the United States came out on the losing end. But you won’t find anything in here about military tactics or strategy. Or the American media or the antiwar movement. What’s missing, she contends—“the core reason we lost in Vietnam”—in her words, is that American leaders from the Truman to the Ford administrations “failed to see the ethnic dimension” of Vietnamese nationalism. Amy Chua’s definition of the Vietnam War’s “ethnic dimension” in a nutshell: the multi-millennial conflicts between China and Vietnam. Chua makes her case with a brief recap of Vietnam’s enmity toward China, and an even briefer look at how the U.S. got into the Vietnam War, starting with fateful decisions made at the end of World War II. She delves deeper into the strong impact of ethnic Chinese people living in Vietnam. This, she says, is a good example of a “market-dominant minority,” a term Chua coined that describes the many entrepreneurial ethnic Chinese Vietnamese citizens who all but controlled South Vietnam’s “lucrative commercial, trade, and industrial sectors” for centuries, including during the American war. All of this rings true. Chua’s contention, however, that the fact that ethnic Chinese people dominated South Vietnam’s economy had a significant impact on the war’s outcome is harder to swallow. Yes, our South Vietnamese allies were generally not very effective fighting the Viet Cong and North Vietnamese. But to put the lion’s share of the blame for that on the South Vietnamese government asking its people “to fight and die—and kill their northern brethren” in order to keep the [local ethnic] Chinese rich” seems to be a huge exaggeration. To her credit, Chua notes that many South Vietnamese were less than willing to fight their communist brothers for another reason: They had little love for a seriously corrupt regime that was asking them to do so, a regime—not coincidently—backed by the U.S.
Jack Nolan served for three years, from 1967-70, in Army intelligence. He was stationed at Fort Holabird in Baltimore, and then to Vietnam where he worked in bilateral operations in Can Tho and Saigon before returning home to train others in that arcane craft. This small group embarks upon one zany escapade after another. They are all bright guys who effortlessly take part in cockamamie adventures, misadventures, and civilian cover stories that boggle the mind. They dress civilians so they can pass as nonmilitary contractors. This is a literate, smoothly written, well-plotted novel unlike any others I have read about the American war in Vietnam. I enjoyed it and highly recommend it to anyone who would like to read a book that is well-edited and that goes its own way to produce an entertaining read filled with surprises and many twists and turns. That said, the book nods in the direction of the familiar a few times. For instance, the song “We Gotta Get Out of this Place” is genuflected to as it is in hundreds of other Vietnam War novels. Fragging is also considered and the case is made that the war machine is run by a group called The Clerk’s Mafia. Army clerks like to kid themselves that they are the ones in charge of the war, but I (a former clerk) have my doubts. For a different look at modern war—and for quite a few laughs—read Vietnam Remix. You won’t regret it. Johnny Pugh was drafted into the Army when he lost his college deferment. He went on to serve in Vietnam with the 25th Infantry Division beginning in the sweltering heat of July 1966. It was just the first of many shocks for the young biracial New Mexican. Those shocks that took place during his twelve months in country took over his mind and body in ways Pugh never could have expected. He survived combat with only two Purple Hearts, but his soul was destroyed. Through Smoke-Teared Eyes: The Vietnam War I Fought (iUniverse, 293 pp., $21.95, paper; $3.99, e book) is a wonderfully written narrative of Pugh’s twelve months as an infantryman. It is heart-breakingly honest as Pugh brings the reader into his hooch and lives and walks you with him as he goes through the horror of combat with his unit, Company A of the 2nd Battalion of the 27th Infantry Regiment. The writing flows as Pugh leads the reader into the killing zones of Operation Attleboro. You cringe at the brutality of war, along with the insidious nonsense that follows it. Pugh tells of his exposure to the black market and other moral challenges he faced with his buddies. There is little humor and a fair amount of Chicano street language that is easy to follow, but what comes through above all is the honesty of the man as he coped with the ghosts he encountered. Pugh began writing this book as his health declined. He went back to letters his family had saved from those days and the reader can see him take the words from paper and into the reality he faced. Pugh died in 2011 before finishing his book from the all-too-common ills of the Vietnam War: PTSD, Agent Orange, denied VA treatment, alcohol, drugs, and the hardships our nation put on the backs of its Vietnam War veterans. The book is a testament to his sheer determination and will to write his story for others to see. Pugh’s third wife and young daughter took on the task of getting the book ready for publication—a labor of love. The book is important for several reasons. First, it is a written window into just one of the millions of kids our nation’s leaders sent to war under false premises and with false promises. Johnny Pugh was strong enough to write his story. He could easily have been one of thousands who were unable to write it. It is a book that needs to be sent to every politician as they consider sending young people to kill and maim in the name of freedom. For some, the book will be a hard read because it exposes many unpleasant truths. The truth of officers, poorly trained, and foggy missions leading to the deaths of friends for no apparent reason. The truth of fear of dying, fear of losing friends, fear of betrayal by those you think are friends. The fear of cowardice or defining courage. These are all in question as one reads Pugh’s story. Through it all, you see the mind of a young and innocent man grappling with the brutal reality of day-to-day living in the infantry in the Vietnam War. In the end this is eulogy for Johnny Pugh all of his fellow infantrymen who served in the Vietnam War. I believe that Army generals are cut from the same khaki cloth. Young officers find mentors and devotedly follow them until it’s their time to lead; then they collect followers and mentor them. In that way, generals maintain their version of what Kipling called “the thin red line.” Generals live in a world unto themselves. Lessons in Leadership: My Life in the U.S. Army from World War II to Vietnam (University Press of Kentucky, 261 pp. ; $50, hardcover; $40, Kindle) by Gen. John R. Deane Jr. and edited by Jack C. Mason validates my belief. 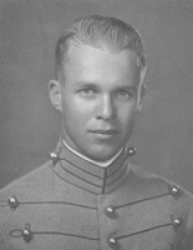 Deane graduated from West Point in 1942 and served in the Army until 1977. He fought in World War II and in Vietnam. His father was a well-liked major general, a fact that opened many doors for John Junior, a situation he frequently acknowledges. 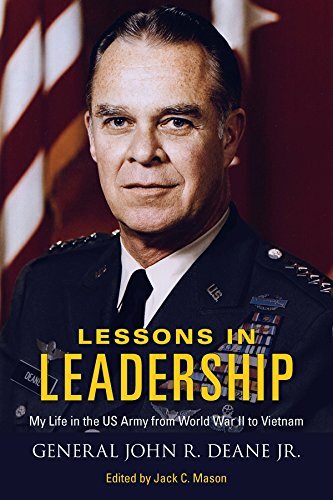 True to its title, Lessons in Leadership provides guidance from Deane accumulated as a staff officer and a commander who attained four-star rank. He often cites his teachers. For example, Gen. James Gavin taught him, Deane writes, to “inspire people to outdo themselves” and then he tells how he built on that idea. Deane also preaches that “substance is more important than form,” words that should be tattooed on the forearms of PowerPoint-crazed staff officers. He tells stories in a conversational style that flows from topic to topic. He narrates combat experiences in a nonchalant, nearly emotionless, voice. He underplays them and yet delivers the full impact of what took place. Deane’s writing allows a reader to experience vicariously what he did and to understand exactly why he did it. In World War II Deane and his men entered combat in October 1944 and engaged in all-but continuous fighting for two hundred days. He rose to the rank of lieutenant colonel and received many decorations as a battalion commander in the 104th Timberwolves Infantry Division led by Gen. Terry Allen, a boyhood idol who became a friend. Deane’s account of time in the Vietnam War sets new standards for leadership. With the 1st Infantry Division commanded by Gen. William E. DePuy, Deane shared deputy commander duties with Gen. James E. Hollingsworth, whose life is recounted in the new James Willbanks biography, Danger 79er. The three generals flew low in helicopters and frequently landed in the field alongside their men in combat. After taking over as the commander of the 173rd Airborne Brigade, Deane jumped with men (first man out the door) in February 1967 during Operation Junction City to form a blocking force for two hundred fifty follow-on helicopters with five thousand soldiers. Deane imparts thought-provoking lessons he learned during that time. Eyewitness accounts from soldiers interviewed by Mason support Deane’s recall of many events. 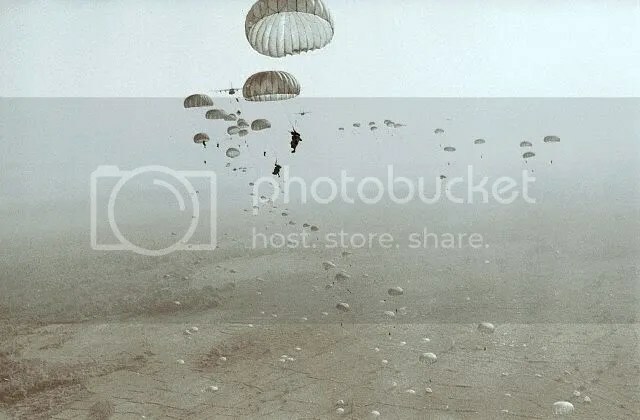 On Feb. 22, 1967, Gen. Deane led the 2nd Battalion of the 503rd Parachute Infantry out the door of a C-130 north of Tay Ninh City in the first U.S. combat jump since the Korean War, and the only mass jump of the Vietnam War. Beyond the two wars, Deane commanded forces in Germany, Korea, and the Dominican Republic. He also worked in research, engineering, and force development. Based on these jobs, particularly those in Washington, D.C., he recalls encounters with senior officers and career managers. He explains how to make sound decisions while working with senior people, as well as uncovering weaknesses without getting everybody mad at you. When you do your job well, he says, you can make enemies. The solution is to do what best meets the objectives of the organization. His discussions of several events in his life read like pages out of Catch 22. A couple of his encounters made me laugh out loud. At the same time, his teaching is priceless. When describing other men, Deane details not just their actions, but also blends in their personalities and brings them fully to life. 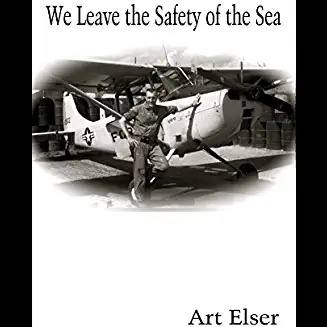 He ties together stories, recollections, and rumors to explain controversies about leadership such as Terry Allen’s loss of command of the 1st Infantry Division during World War II. In these passages, his storytelling resembles a Vanity Fair exposé. He ends each account by explaining how it influenced his leadership style and the behavior of his subordinates. He repeatedly credits subordinate commanders for his units’ successes. With authoritative certainty, Deane categorizes leaders into four groups largely based on a willingness to commit oneself to a task. Category One contains fearless people—beyond a physical sense—who make decisions without fearing personal consequences. Category Two’s people know and feel fear but have a characteristic that drives them onward, such as pride, religion, or family. Category Three is composed of followers of the leaders in the two other categories who need help to conquer their fears. People in Category Four will quit, no matter what happens. These categories apply to civilian as well as military leaders, Deane says. Credit for the book’s readability must include its editor Jack C. Mason. A few years before his death in 2013 at the age of ninety-four, Deane provided manuscripts to Mason that documented his career. After that, the two men communicated nearly daily. “When I asked him to explain or expound on something, he replied in detail,” Mason writes. Mason also researched information that broadens Deane’s stories and includes these findings as italicized paragraphs in the text. A recurring theme is the clash of egos between generals. Deane does not hesitate in naming those he considers worthy of star rank and those who were unworthy. In the latter case, he reduces the image of one general to that of a sobbing infant. Which is one reason that reading Deane’s book provides more lessons about Army generals than some people might want to know. The poet D.S. Brown served as a medic with Bravo Company in the 1st Battalion of the 14th Infantry Regiment in Vietnam in 1969-70. He is the author of three poetry collections: Returning Fire, The Other Half of Everything, and Assuming Blue. His poetry also has been anthologized in American War Poetry, Carrying the Darkness, and Unaccustomed Mercy. In his latest collection of poetry, Ghost of a Person Passing in Front of the Flag (Bloomsday, 88 pp., $16, paper), the text is augmented with appropriate photographs. This beautiful book—with cover art by Randy Twaddle and interior photos by T. J. Amick, a 196th Light Infantry Brigade vietnam War veteran—is filled with one damned fine poem after another. they loved us for the body count. These fractured lines and invented words communicate the madness of the Vietnam War better than any well-ordered, regimented format ever could do. W.D. Ehrhart, the poet and Vietnam War Marine Corps veteran, seconds that thought. I served in Vietnam, but never saw combat as Brown and Ehrhart did. This book gives a taste of the confusion and chaos of battle that would have gob smacked me. Read D.F. Brown to experience the disorder of war. Prepare to be disturbed.